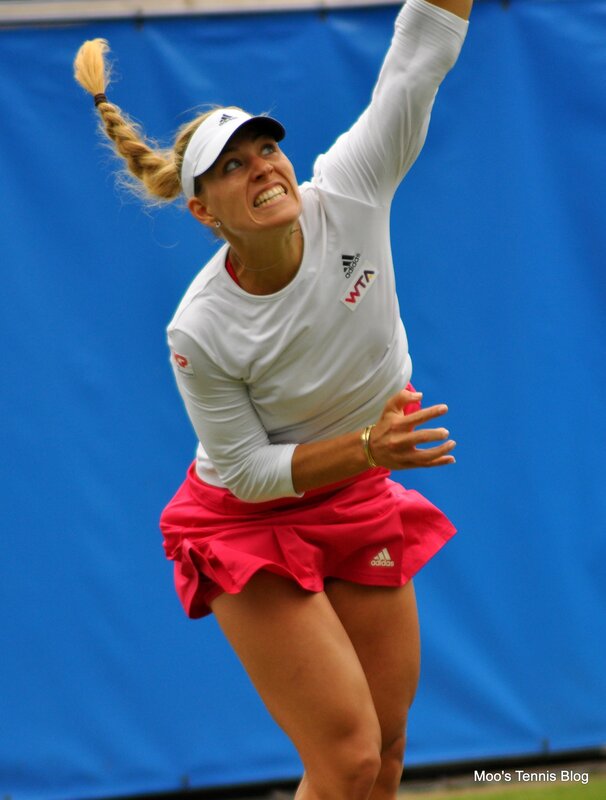 I was really looking forward to this match and put in my original preview for Eastbourne HERE that I thought Kerber would win in three entertaining sets. It didn’t go three sets, but it was highly entertaining. This was a superbly contested match. Kerber was a touch more consistent, particularly in the crucial moments of the match. 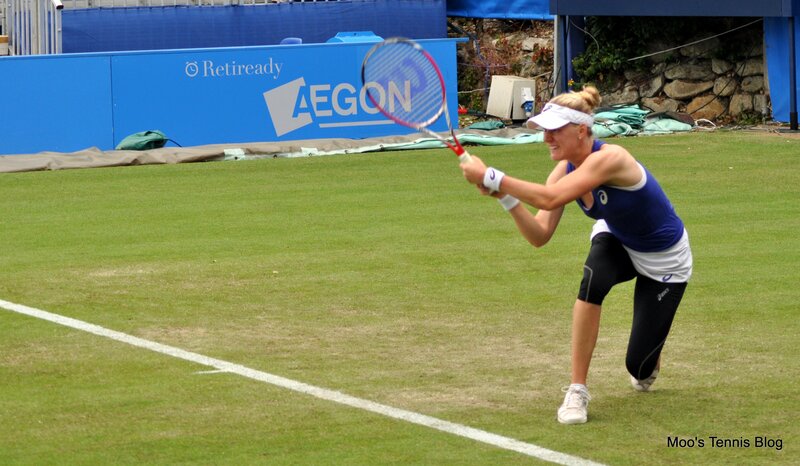 Riske looked great on the grass and I loved her urgency to close points at the net. 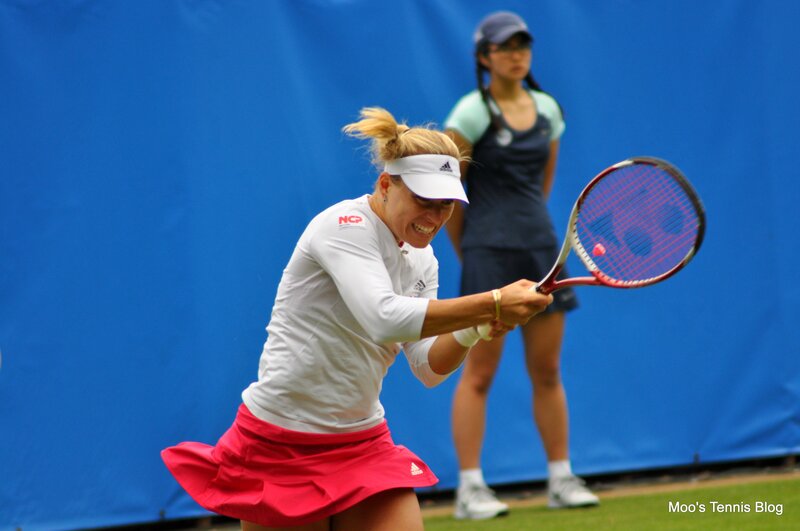 It wasn’t always working as Kerber was really zoning on the passes, but I liked the intent from Riske. This was one of Kerber’s best performances of the year against a more than respectable opponent. Her forehand down-the-line was working really well and she wasn’t afraid of attacking when she needed to step it up. Riske did enjoy some success on the Kerber second serve, but on the whole it was a very solid serving performance from Angie. After one break each, the first set went to the tiebreak, which turned out to be a mixed bag; Kerber went up a mini break but forfeited the advantage with back-to-back double faults. 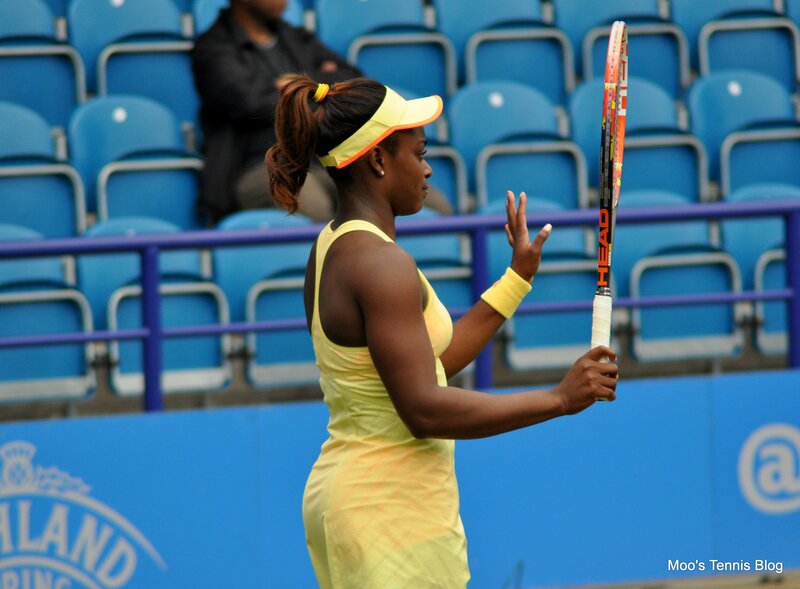 She would later rack up three set points, which were all saved by fantastic winners from Riske. 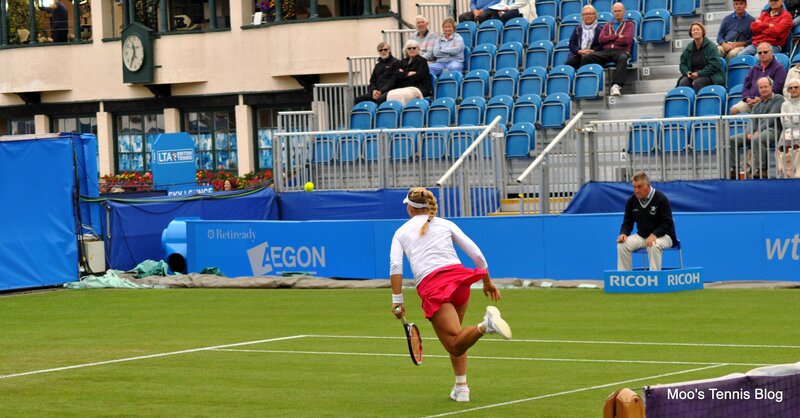 Unfortunately all Alison’s good work was undone by a double fault at 6-6 and Kerber wrapped up the set. There were a number of really lengthy deuce games in the second set. The quality remained really high through the second set as there were plenty of brutal rallies with the majority finishing on winners. I really admired Riske’s fighting spirit. She played each point with the same intensity and her attitude on court is a terrific example to any new starters on the tour. 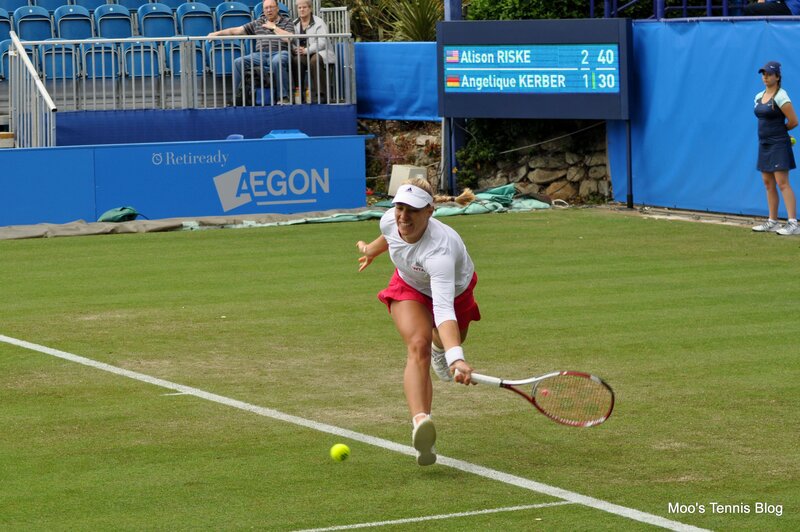 I was pretty sure that the Kerber v Riske match would be the best one I would watch in my three days at Eastbourne. This Radwanska v Pavs match more than matched the first. It was absolutely fantastic. Radwanska did not play a bad match at all. I don’t know if it was because I watching it live or just on this day, but her serve and groundstrokes had more pop on them than usual. Her squat shots were also in full glory on the grass. She did make quite a few loose errors in the final set, but overall, she played much better than she did in her first round loss to Jamie Hampton at this event in 2013. 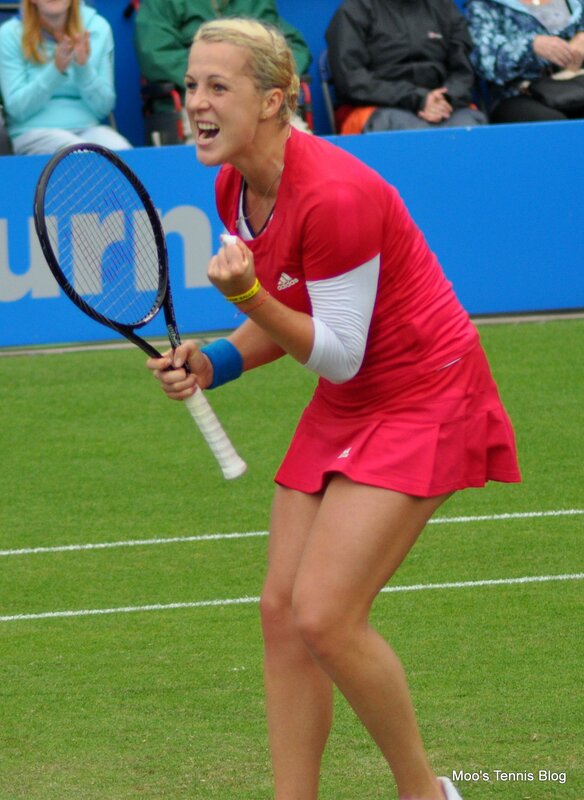 Pavlyuchenkova was really pumped up for the whole match and striking the ball beautifully. She also matched Aga with her invention and pulled off some really cute drop shots. Some of the rallies in the deciding set were just brilliant. I loved all the variety in the match and there was great respect between the pair with both racquet clapping each other’s shots. There were a few drops of rain at the end of the match but thankfully that was it. This was an absolutely huge win for Pavs, who had lost back-to-back three setters to Radwanska. 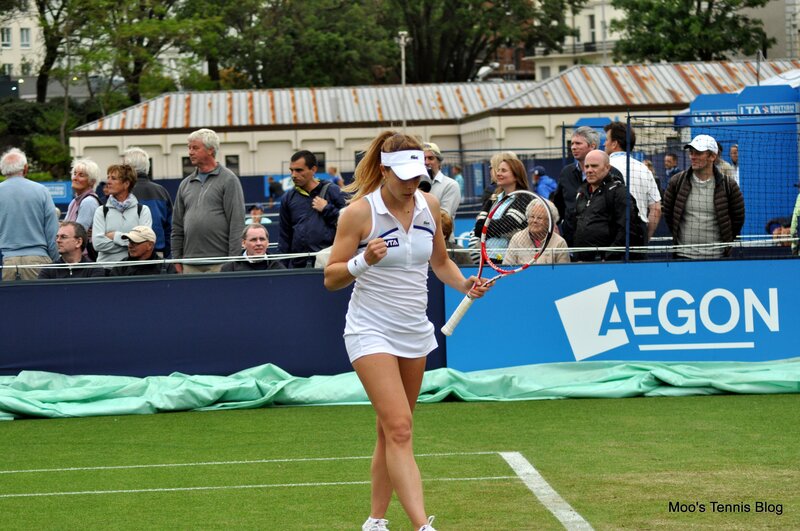 I was impressed with Radwanska despite the loss and like her chances at Wimby. I was expecting Pavs to fall away at some point, but she never did, and was fully deserving of her win. In terms of handshakes, this was a pretty nice one from Aga! It was difficult deciding whether to watch Wozniacki v Stosur or Stephens v Garcia. In the end, I went for Garcia v Stephens as I had never watched either player before. After two great matches, I was due a dud! If you’re thinking that Garcia is going to have a run at Wimbledon, think again. This surface is just not for her. She kept over hitting and could barely find the court all day. Garcia was also not convincing in her movement across the grass. I really enjoying photographing Sloane. She had some great facial expressions during this match. Sloane didn’t do a great deal, but she was surprisingly solid. She was loose serving both sets out, but Garcia just didn’t have the game to prolong either sets. The most noteworthy moment of the match was when Stephens hit a ball at Garcia, which nearly destroyed her face. 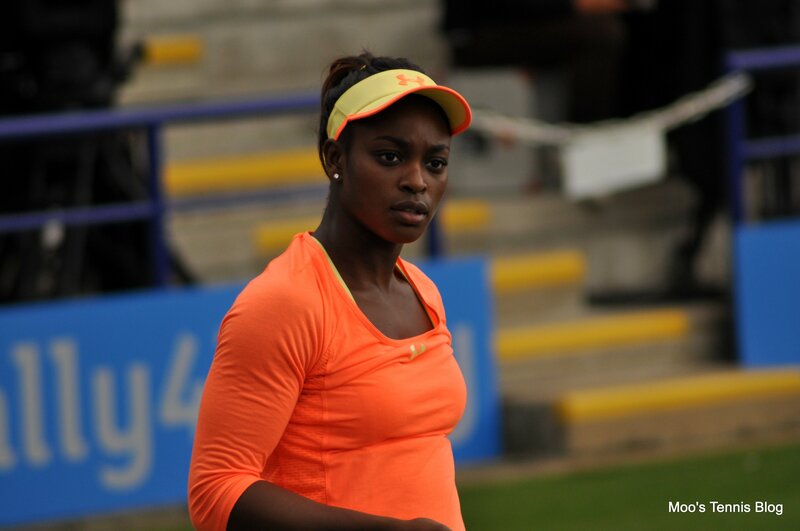 Garcia turned away, Sloane screamed out “sorry” and then apologised again. From the handshake, I don’t think Caroline was too impressed. To Garcia’s credit, she never gave up in the second set and won a few more games than she probably should have. She wanted this win more than Sloane. It was a really flat atmosphere on court 1. Eastbourne is a really well attended event and the crowd are very respectful. Sometimes though, the crowd are so quiet and don’t even clap. I was the only person clapping on some points, which feels weird! Here’s the handshake in four shots… it was brief. I watched chunks of this doubles match. Pavs and Safarova are a really adorable doubles pair and they looked like they were having a lot of fun. Lucie seems likes such a sweet person. If you haven’t already gathered from my previous blog entries, I’m a big fan! They were both a little streaky at the end, which was understandable from Pavlyuchenkova, who had that very long match with Aga. Aoyama and Niculescu were delighted with their win. 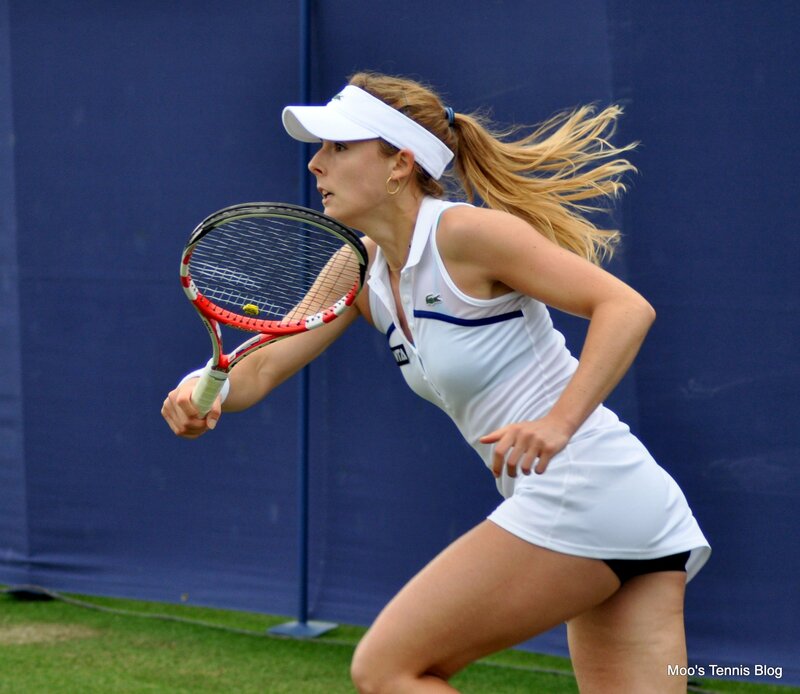 After the Sloane v CarGar dud, I needed drama so I headed straight over to watch ALIZE. She is so much fun to watch because you are guaranteed some kind of hilarity. 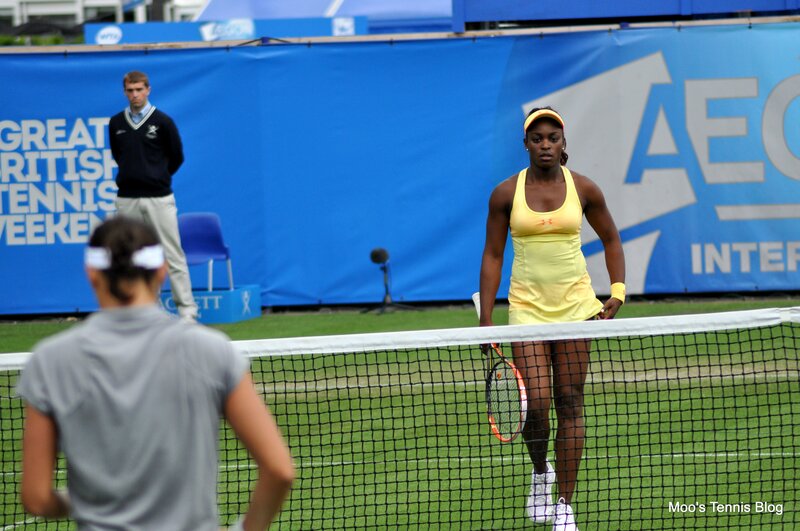 She was 6-3 5-1* up but was still pissed at a decision by the umpire, Zhang and repeatedly shook her head in fury. Others around me were laughing too. Cornet was playing really well. Jovanovski looked a little like a rabbit in the headlights. She did put up some resistance at the end in a lengthy final deuce game. Cornet won the match on a lucky net cord and she was very apologetic. 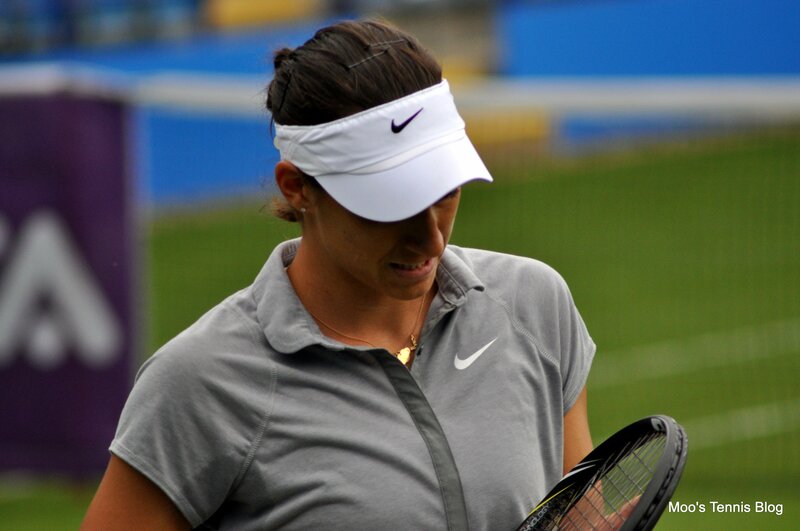 It was a nice handshake and I got the feeling Jovanovski knew she had been beaten by the better player on the day. Cornet can be over dramatic, but I am a fan. Tennis needs characters like Alize. 1. Heather Watson wandering around a road junction outside the venue looking lost waiting for someone. 2. Karolina Pliskova and Jeremy Chardy saying hi to each other as they passed by the practice courts… Groundbreaking news, I know! 3. 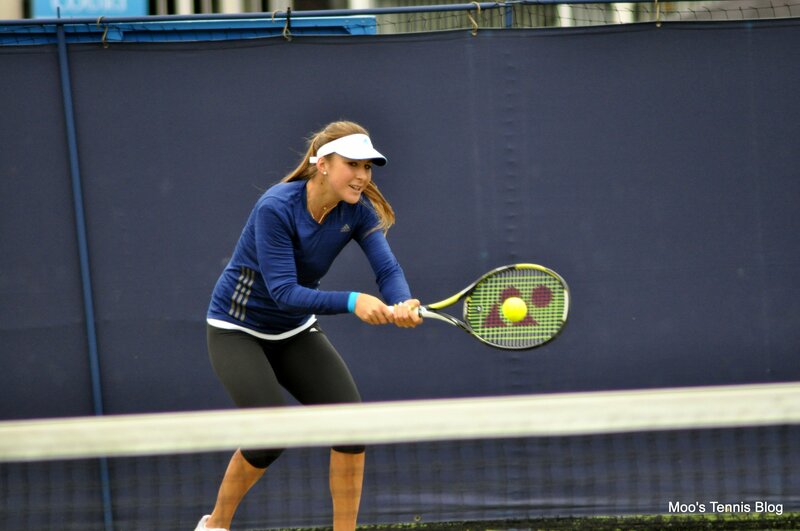 Belinda Bencic warming up with Karolina Pliskova. I saw Belinda everywhere! She also came on to Centre Court to watch some of Radwanska v Pavlyuchenkova. 4. 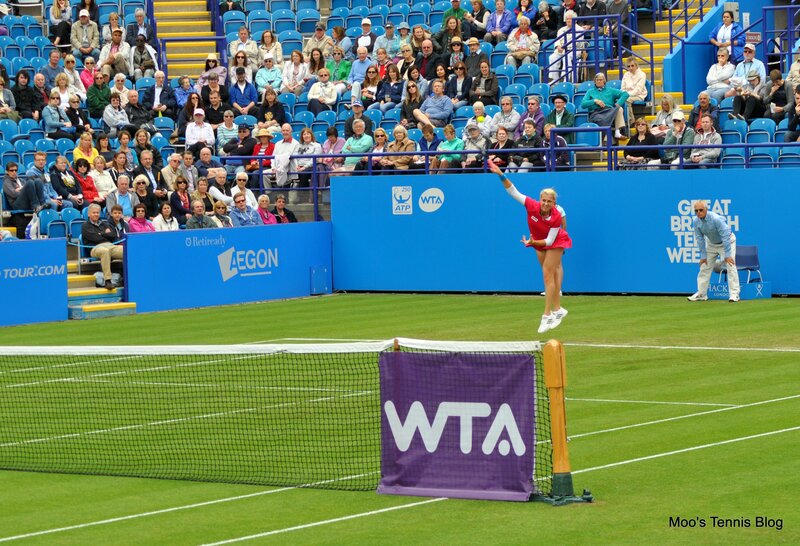 Caroline Wozniacki showing her hands to Piotr during the Aga v Pavs match… Was this shown on the TV coverage?! 5. Mo Lahyani running. He’d forgotten something I think! 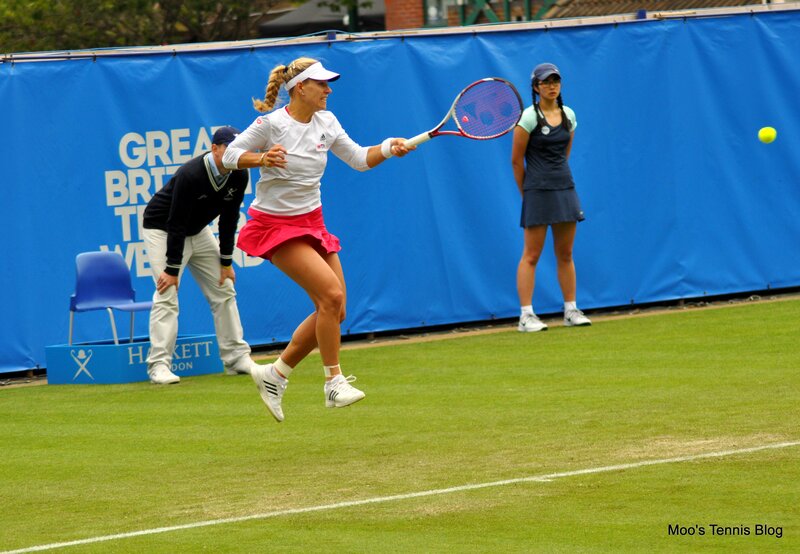 June 19, 2014 in Eastbourne, Garcia, Kerber, Pavlyuchenkova, Radwanska, Riske, Safarova, Stephens, Tournament Report, WTA. Nice recap and some great photos too! Lovely recap! 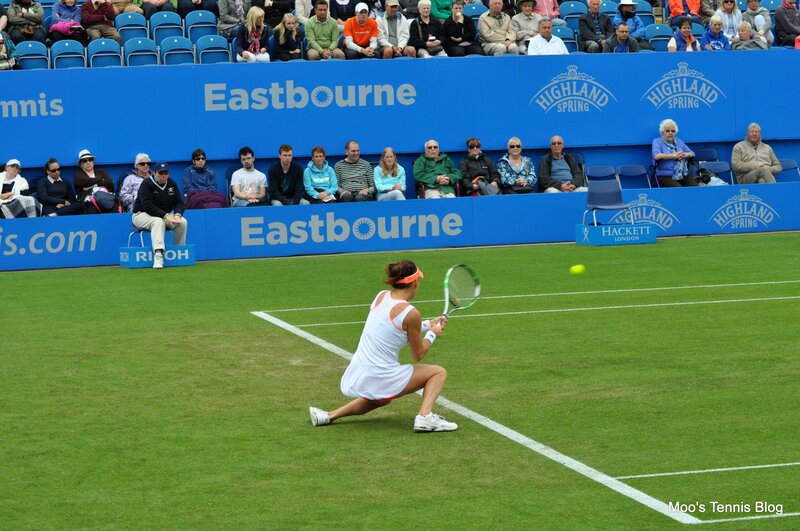 It’s stunning how much Aga kneels at her shots. That pic is my favorite. I shared it on my Pinterest as well 😉 But I can’t wait for the JJ photos hehe.